The new 2019/2020 season is about to start with an exciting new game! Every lunchtime up until half term, there will be an oppurtunity for any John Warner pupils who are would be Robot Rumblers to come along for a free practice session. The session will take place in room 107 and will offer students the chance to drive one of The Control Freaks award-winning robots. Head to Head – Competitors face off against each other in a two vs two battle to see who can clear the field completely or within the alloted 2 minutes. Challenge your mates or face off against one of our seasoned Robot Rumblers. Skills Challenge – individual competitors will have 1 minute to clear as many elements as possible. The highest score, including the doubler barrel, will top the leader board in this event. 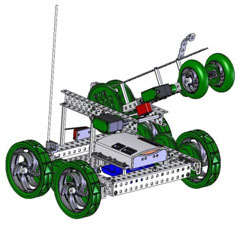 Autonomous skills – Students are not allowed to touch or control the robot as it completes a 1 minute programmed run around the arena to try and score as many points as possible. Students who show an aptitude for precision, tactical thinking and a competitive edge will be invited to join The Control Freaks award-winning team for this seasons game!